Small Cocoon any comfort very well equipped in the small residence Callisto. Our apartment is located in the top of Belle Plagne in the heart of the slopes with a magnificent panoramic view (4th floor) on the ski area and the car-free village of Belle-Plagne, in the small residence Callisto. Departure and return skis from the 2 slopes, it has the advantage of being 50 meters ESF gatherings and a few steps from the heart of the village, thus simplifying access to shops, bars and restaurants, while enjoying a great tranquility. An individual terrace located South - South West (not communicating with the neighboring terraces) will allow you to benefit from the landscape and the sunshine. All the small kitchen equipment is recent and quality. A table for 5 people will allow you to take your meals in a comfortable way. The lounge area consists of two sofas, one of which can be transformed into a bed of 160x190 cm, the other into a bed of 80x190 cm, with a coffee table nice to play or have an aperitif with a view beautiful, listening to some music on the bluetooth / USB / Ipod radio allowing you to easily connect your favorite songs. A pivoting LCD TV allows you to follow the TNT programs from the kitchen or living room. The cabin room located at the entrance with 2 bunk beds of 80x190 cm, has a window overlooking the mountains at the back of the residence. It is separated from the living / kitchen area by a door in the hallway. The bathroom with toilet has a nice bathtub to relax in a good bubble bath after a day of skiing. It has a towel radiator and a hair dryer. A closet in the kitchen (in addition to the storage of kitchen furniture) and 3 cupboards in the lobby will allow you to store your belongings. A support at the top of the closet is handy for removing helmets and other small equipment when returning. The ski locker is located in the Ski-room, 30 meters from the track (starting and arriving), thus limiting the transport of the equipment as much as possible. The residence is served by the underground car park (paying in winter) which allows direct access from the vehicle. Cleaning is not included in the price but may be offered upon request at the time of booking, so that we can request our partner sufficiently in advance. Great apartment, great location, faultless and 5 star ⭐️ ! This is a great apartment with modern up to date facilities in a great location. Very comfortable and the owner was very helpful and thought of everything to make our stay hassle free. 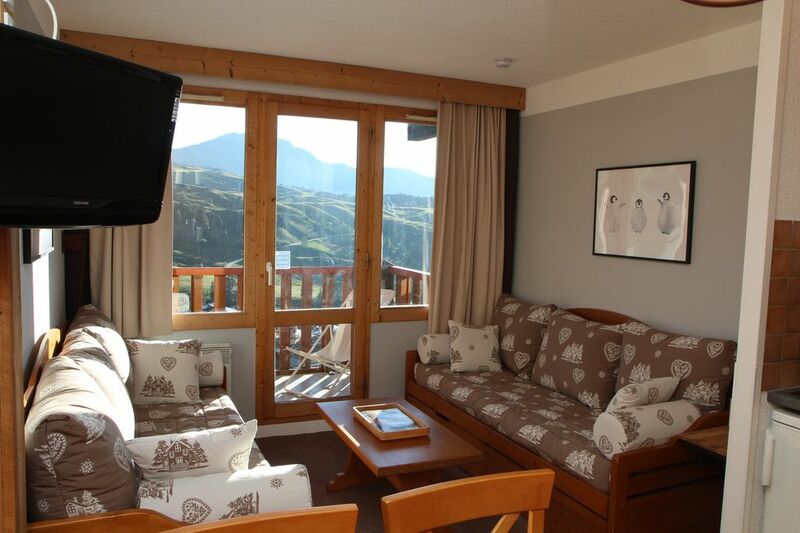 The apartment is in a great ski in ski out location and close to shops, bars and restaurants. I would not hesitate to recommend and will look to stay here again. The owner is very helpful and provided lots of information before our stay.. Thank you Valarie, we will certainly look to return in a future season. Appartement pas très grand mais très propre, très bien équipé et joliment décoré! Il est très agréable d’y séjourner et la vue est magnifique ! Il est situé au pieds d’une piste et les cours ESF sont maximum à 100 mètres. Du coup il est possible de quitter l’appartement ski à pieds et d’y revenir en ski. Nous avons passé un excellent séjour. Par ailleurs la propriétaire est très sympathique et la communication est très aisée. Très bon séjour malgré une météocapricieuse . Nous ne connaissions pas La PLAGNE et nous sommes ravis d’avoir choisi Belle Plagne, le plus joli village de la station de notre point de vue. L’appartement est idéalement situé car La résidence callisto surplombe la station toute en étant à proximité des points d’intérêt. On accède directement aux pistes au pied du bâtiment, l’ESF est à 30m, les commerces sont accessibles par un escalier ou ascenseur à 5 minutes. L’appartement est fonctionnel et cosi. La vue est imprenable, le soleil donnant sur la terrasse dès le midi et devient pénétrant dans l’après-midi : magnifiques couchés de soleil. Et des la nuit tombée, le balai des dameuses commencent au plus grand plaisir de nos enfants et de nous mêmes. Le petit coin lit superposé a très bien convenu aux enfants, le lit gigogne du salon étant facilement modulable pour les parents dans le séjour. Nous reviendrons avec plaisir dans cet appartement. Splendide séjour, confort et situation idéale !